In the fictional town of Lake Woebegon, all of the children are above average. But in the real world of California, all of the counties are disadvantaged. Cap and trade is one of the main greenhouse-gas-reduction components in the implementation of AB32, the Global Warming Solutions Act of 2006. It’s projected to raise $832 million in the current fiscal year that will be doled out to various state agencies. Senate Bill 535, passed in 2012, mandates at least 25 percent of cap-and-trade spending must benefit disadvantaged communities, with at least 10 percent going to projects located in those communities. CARB, which implemented and administers the cap-and-trade program, identifies “disadvantaged communities” based on their California Environmental Protection Agency CalEnviroScreen score. 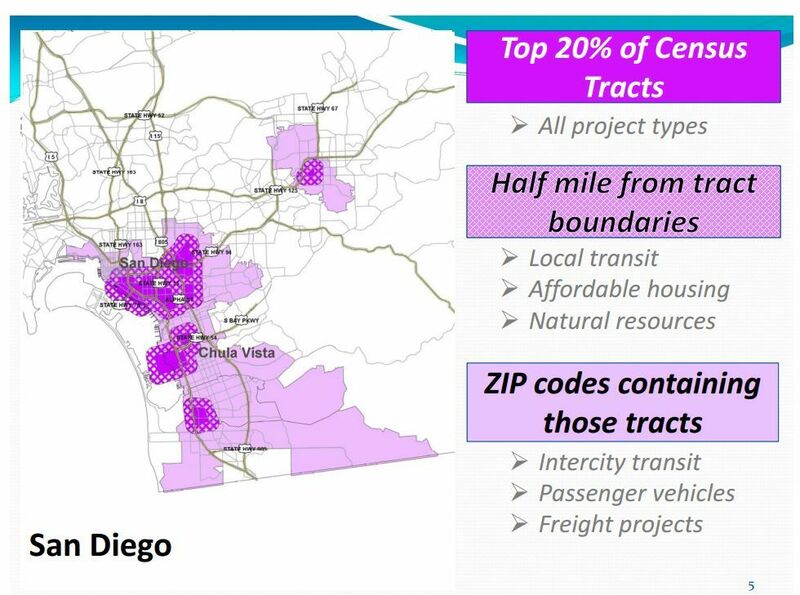 Each of the state’s 8,000 census tracts are scored from 0 (least disadvantaged) to 100 (most disadvantaged), based on 12 pollution and environmental factors and seven population characteristics and socioeconomic factors. The most disadvantaged communities are generally those with the highest levels of pollution and the poorest population. They are predominantly in the agricultural Central Valley from Sacramento to Bakersfield, along with urban pockets in the Bay Area, Los Angeles and San Diego. In the November election, she is running for state controller as a Republican against Democrat Betty Yee, a member of the state Board of Equalization. Dark purple marks the more disadvantaged areas. Light purple indicates intermediate areas. Roberts didn’t like the CalEnviroScreen white coloration on the southern end of his county near the Mexican border. “Where those two freeways come together in that white zone is the busiest border crossing in the world,” he said. “The fact that’s not a bright purple, it is disadvantaged in every way, shape, or form,” said Roberts. “Let me finish,” said Roberts. “The EnviroScreen may be good for some things, but this is being missed. That whole area should be bright purple, not just the white. The fact that it’s not, should signal somebody that the model we have is not accounting for what’s happening on the ground. There is no way that I can support something that basically ignores the situation like this. There is also disadvantaged disgruntlement from officials at the other end of the state. Alan Abbs, the Tehama County air pollution control officer, is concerned his county’s census tracts are in the 25-30 percent most disadvantaged ranking, although the cutoff for funding might be at the 20 percent most disadvantaged level. “Tehama County as a whole has a population with a median household income 33 percent below the state median,” Abbs told the board. “We have the highest asthma rates in the north state. And like any county in California, we have pockets that are significantly less well off than other pockets. So at the outset, I would urge the board to consider going beyond the 20 percent level when you’re looking at disadvantaged communities. Also concerned that the CalEnviroScreen rankings may not provide the whole picture, particularly in rural areas not in the Central Valley, was Tehama County Supervisor Bob Williams, representing the Rural County Representatives of California. “CalEnviroScreen multiplies pollution burdens by the social and economic characteristics of the community, basically eliminating areas of the state with good air quality from being defined as disadvantaged communities, no matter their socioeconomic status,” said Williams. “Using strictly the CalEnviroScreen as a source for recognition could potentially eliminate a minimum of counties from consideration, including counties such as Lake, Modoc, Plumas, and Lassen. If you’ve been to those counties, you would be hard pressed to deny they have disadvantaged areas. Nichols was sympathetic to their concerns. “We do understand this issue about rural areas, which undoubtedly are among the poorest of areas within the state of California, but are not the ones that fit the criteria of being impacted the most in terms of multiple sources of pollution,” she said. But advocates for poor urban areas aren’t keen on spreading the disadvantaged money around to less disadvantaged areas. They want the most disadvantaged communities, particularly those with minority populations, to get most of the money. Also in favor of concentrating the money where it’s needed most was Marybelle Nzegwu, a Public Advocates attorney representing the SB535 Coalition. “We would like to see the guidelines at least provide guidance that scoring and ranking should prioritize certain types of projects, should prioritize projects that benefit the most disadvantaged communities, should also prioritize projects that provide the most benefits in the most significant way,” she said. CARB voted 9-1 (with Roberts voting no) to adopt the disadvantaged communities spending guidelines outlined in their staff report. They also agreed to send a message to CalEPA that they feel there are some discrepancies in the CalEnviroScreen map ratings they would like addressed.